Try making some of these specialty burgers the next time you're having a barbeque and you'll be impressed by how delicious they are! They look like a classic hamburger, but these are made with a combination of ground beef and pork, packed full of flavor before getting topped with cheese. One bite of this burger and you will know it is something special. This incredible burger only tastes like it costs $50. Made from rib eye steaks and topped with onion rings, morel mushrooms, and shallots. This burger is worth every dime. The patty alone on this burger is enough to satisfy most anyone in terms of flavor but loaded up with a fried egg and avocado you will be wanting this burger any time. This one isn't beef. The patty on this burger is made from bratwurst and then piled high with sauerkraut and pickles. Best of all, this is actually a quick and easy burger to build. The patties on these burgers are stuffed with chopped bacon and cheddar cheese and then topped with more bacon and cheese. This is truly the best bacon cheeseburger you will ever build. Do you like double cheeseburgers? This burger stuffs a giant patty full of cheese and bacon and then tops it with, yes, more bacon and cheese. This is the ultimate bacon double cheeseburger. Stuffed with onion flavor and topped with cheese and a fantastic steak sauce aioli, this is the onion lover's best bet for a great meal. This is a quick and easy burger that offers so much more than you will find in even the best restaurants. Some people seem to think it's strange to top a burger with meat, but bacon burgers are a thing, so why not a burger topped with pastrami? This burger also gets a slice of Swiss cheese and a delicious sauce to make it one of the best burgers in the world. It's the port wine sauce that makes this gourmet burger stand out. Large enough for two people, this is the burger that borders on fine dining. A cross between a Gyro and a hamburger, these little lamb burgers are perfect as a meal or as an appetizer. These are a fantastic sandwich to serve for game day or any other occasion. Quick and easy, these are sure to please. Filled with Cajun Seasoning and topped with a spicy barbecue sauce, this is a great burger for the heat lover in your house. Top it how you like, but I suggest some red onions to add a little extra burn. Do you like Buffalo Chicken Wings? This burger has all those flavors on a chicken patty, loaded up with a spicy buffalo wing sauce and blue cheese. Quick and easy burgers that are so good you should probably plan on making two for everyone. The Honey Dijon sauce that tops these burgers has a sweet heat that lifts the flavor of these burgers to a whole new level. The classic Hawaiian Burger gets some grilled pineapple slices and teriyaki sauce to make it the great American/Asian hybrid hamburger. Ground Lamb makes a fantastic burger. All that flavor can turn a regular hamburger into something amazing. These lamb burgers will quickly become a favorite. The classic combination of ingredients, topped with feta cheese, is a real crowd pleaser. Stuffed with cream cheese and jalapenos, the patty on this burger is creamy and spicy and ready to be topped with whatever you like. Dill is a classic flavor and these burgers are loaded with it. Quick and easy, you can put these burgers together in very little time and enjoy something great. Perfect for a weekday meal. You can make these with ground chicken or turkey. Either way, the fresh pickle flavor pops out of these burgers. It all gets topped with a tarragon aioli for a grown up flavor that everyone will love. Yes, it is possible to grill a crab cake. A clean grill and a good spatula are all you need. These burgers are something completely different, loaded with flavor and absolutely amazing. 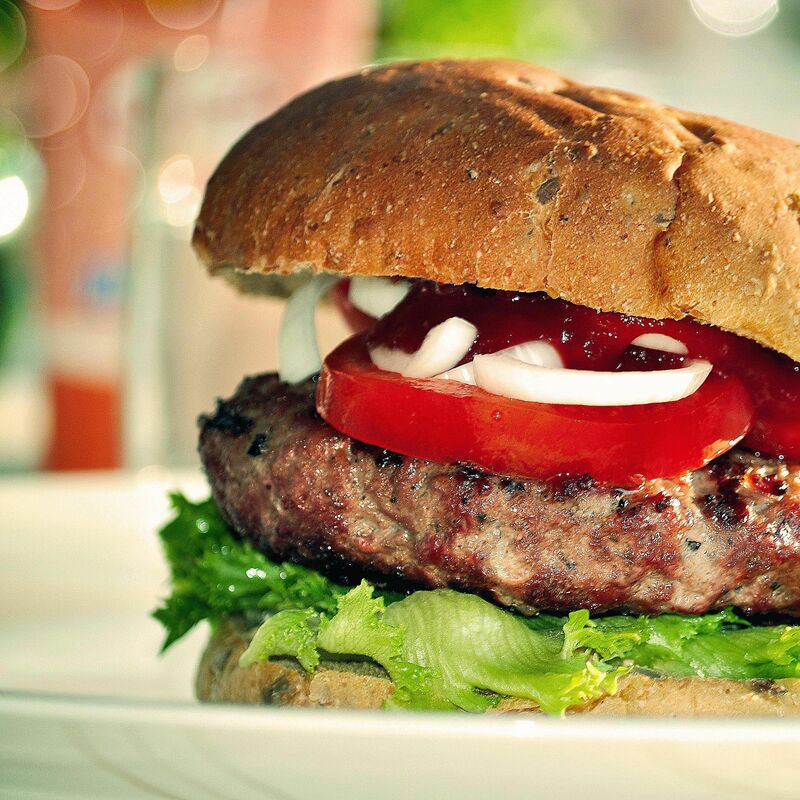 Everyone loves the combination of lamb and mint and these burgers put that flavor up-front. Quick and easy, these are a great way to make a burger that will wake up any palate. Full of seasoning and loaded with great toppings, these are truly burgers to die for. It's a burger in a hot dog bun. It's a burger dog. Start with ground beef, wrap it in bacon and grill it hot and fast. Then put it in a hot dog bun with cheese and jalapenos and you have a whole new take on the classic bacon cheeseburger. Buffalo and Bison make for some fantastic burgers. This meat is a lot like beef but leaner and generally held to be healthier. These buffalo burgers at extra thick and satisfying. Brushed with barbecue sauce while they grill for all the extra flavor. You have to try a buffalo burger at least once. These burgers get the jalapeno right in the patty along with onion soup mix so they are filled with flavor and just the right amount of heat to make them interesting. There used to be a little Greek hangout by the University that I frequented for their amazing Gyros. I have never found the like again but these burgers, while not really anything like a Gyro, remind me of those days. Made with ground lamb patties, these are a quick and easy way to get a Gyro at home. This is one of my all time favorites. A thick, ground beef patty topped with grilled Vidalia onions and a rich blue cheese sauce makes these a meat-eating fantasy. Love Mushroom Burgers? Hate the fact that the mushrooms always fall out? This is the answer. The patties on this burger are stuffed with mushrooms and topped with a thick slice of cheddar cheese. This is the perfect solution. Ever heard of a shrimp burger? Well, you have now. The shrimp gets chopped up and formed into a patty, similar to a crab cake. Then grill, gently, and put on a bun for a fantastic burger that is flavorful and unique. Everyone loves sriracha these days and this burger is filled with it. Sriracha goes right in the burger patty and it goes in the sauce that tops it. Oh, there is also bacon. Did I mention the bacon? Spicy and amazing, this is the burger for any heat lover.